As I gradually learn about the embroidery software and attachments for my new machine, I am trying to find applications in my art pieces. It is easier for me to absorb new information if I have a purpose. I have been especially interested in quilting with my embroidery hoop. After all, why not? In the past few days I have been playing with designing a quilt pattern for an art quilt and then actually doing it. I chose the star anise project I wrote about in my last post. I designed a six pointed bud and have actually created an arrangement of them that I expect to use to quilt the surface of my piece. As a test, I tried quilting a few of the buds to see how they will turn out. 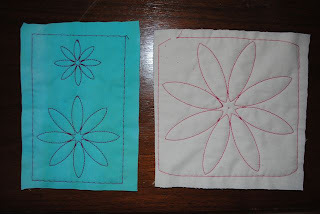 I wouldn't be able to use them as currently designed in other than an art quilt as the back of the quilt is messy. But, I like the way they stitch out. I am looking forward to working on the whole piece next week - when I have my next lesson. Here is how they have turned out. Very pretty. :-) How big are they? The entire art piece is 20'x22'. The big star is about 5' in diameter. The smaller ones are 3 1/2 and 1 3/4. I will keep you posted as I explore this more.